Below is a chronological guide to the 2012 frozen treat season as discovered in my neck of the words. Not all stores carry everything, many have very few of these new products, but keep searching! So Ben & Jerry's got a slight head start on everyone (at least in my area), but everyone else is quickly catching up for a spring which begins in a few short weeks. You all know I hate coconut, but even I found this a cool offering for those who do enjoy it. The new Mounds branded treat is coconut flavored light ice cream with coconut topping and a dark chocolate flavored coating. Again it's a 6 pack of 3 fluid ounce servings, made by Good Humor. 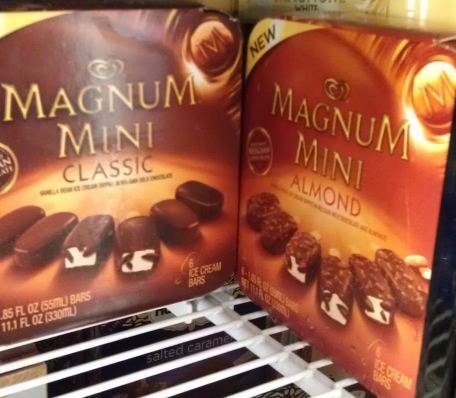 Magnum Mini in both Classic and Almond varieties. They are just over half the size of a normal Magnum. The nutrition panel on the back lists serving sizes of both 1 and 2 bars. This is a smart move considering how "indulgent" (i.e. unhealthy) the original is. 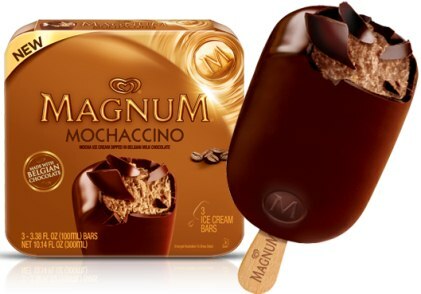 There is also a new Mochacchino Magnum for all you coffee lovers. 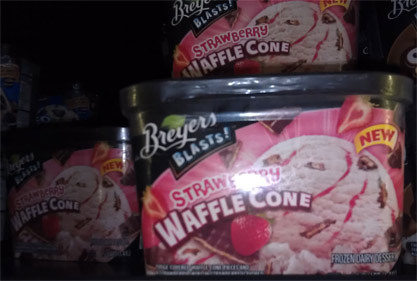 Sorry for the blurry pick, but here are the new Breyers BLASTS! flavors. We've got Chocolate Reese's which actually sounds really good as it's a chocolate base with a peanut butter swirl and reese pb cup pieces. Birthday Blast Oreo mixes things up by changing to a cake flavored base with sprinkles added for good measure (My Birthday Blast review here). Golden Oreo is up top and is a mix of golden vanilla and sweet cream frozen dairy dessert with golden Oreo cookie pieces (My Golden Oreo review here). 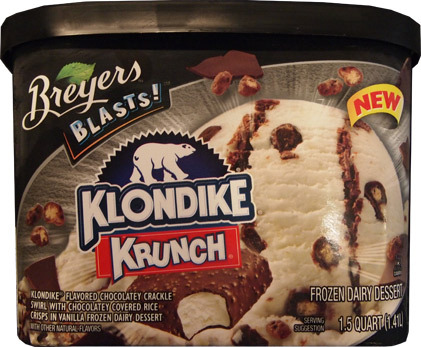 I will admit that I am impressed by Breyers being so bold with these 3 new flavors. To me it feels like a big departure from their roots (Adam has better pics). 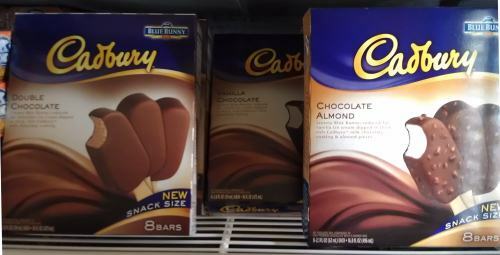 Surprisingly, Blue Bunny has teamed with Cadbury for 3 new snack size bars to get our attention. 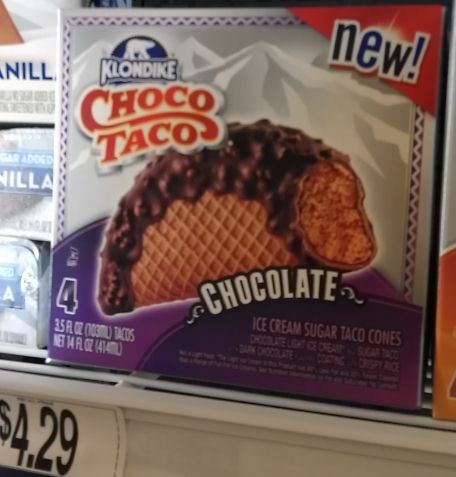 I've known for awhile that the UK enjoys Cadbury ice cream, so maybe this is a way for them to test the American waters. I don't know what's instore, but Blue Bunny's involvement means I will definitely be trying double chocolate, vanilla chocolate, and chocolate almond at some point. They are all "creamy blue bunny, reduced fat ice cream dipped in thick rich cadbury milk chocolaty coating". Update: There is also a Carmello bar and other great new products coming per this Blue Bunny Press Release. --- Check out My Cadbury Double Chocolate Review Here. Blue Bunny also released a bunch of new stuff (press release here). 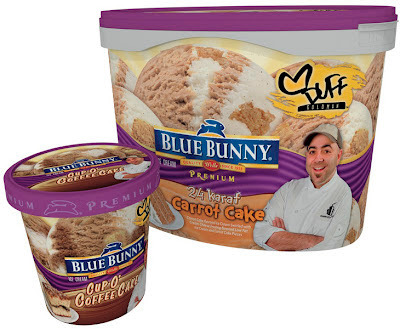 First there are two more Duff Goldman Cake flavors. There is Carrot Cake (review here) and Cup o' Coffee Cake. They also revamped their frozen yogurt which is now known as Naturally Frozen Yogurt. I've already tried the Vanilla and Nick tried the Caramel Praline Crunch. 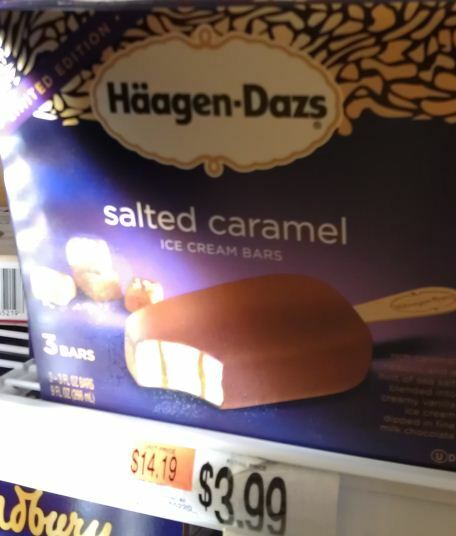 Surprisingly, Haagen-Dazs is releasing a limited edition salted caramel ice cream bar to go with this years limited edition "pint" flavors. It's H-D so I highly doubt this is anything but excellent. Of the pints, the Spiced Caramel Biscuit was excellent, other sites have reviews of the blueberry crumble, coconut macaroon, and salted caramel truffle. 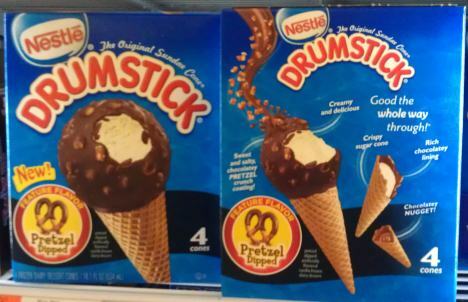 Oh Nestle Drumstick, you almost came back to work with me today. "The Original Sundae Cone" finally has brought my beloved pretzel to a cone, though in a perfect world, the waffle cone would be a pretzel cone as well.... oh, wait, that's interesting: pretzel dipped artificially flavored vanilla frozen dairy dessert. 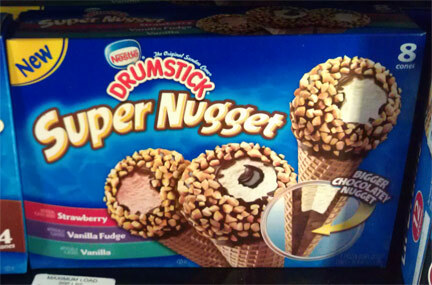 Wow, drumstick moving to a frozen dairy dessert? I feel kind of betrayed. Granted, drumsticks have always been unhealthy... but, well, that's why they were so tasty (and why you don't eat them all the time). 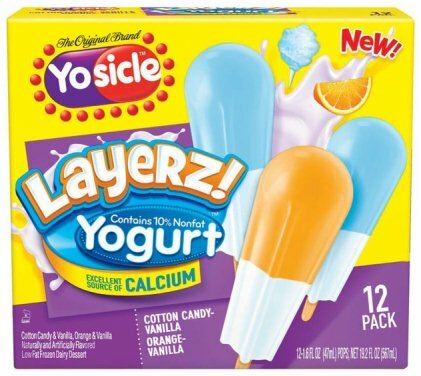 Right off the bat, I have to say: Whoever came up with "Yosicle" should probably be fired. These looks like some kind of bizarre joke. Oh, and second, "LOWFAT frozen dairy dessert"? Isn't that a double negative or something? I guess this one's for the kids who won't eat their yogurt... watermelon and cotton candy flavor? really? I want to hurl just thinking about Duos! I think I just TORPEDOed my appetite. Update: This April 19, 2012 press release goes into a few more details. Duos! 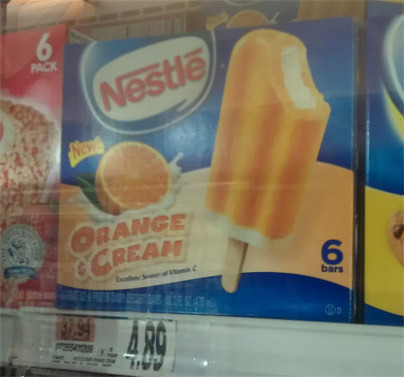 are 1.6 fluid ounce pops made of Low Fat Vanilla Frozen Dairy Dessert coated with (flavored) ice. They come in a mix of either Purple Berry-Vanilla & Cherry-Vanilla or Watermelon-Vanilla & Cotton Candy-Vanilla (shown in the picture above). Torpedo! 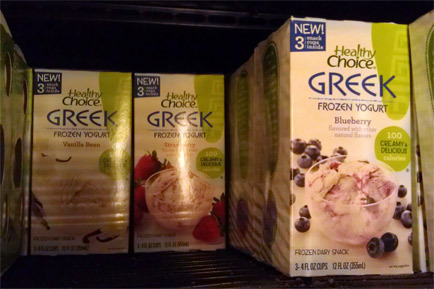 is a three flavored LowFat frozen dairy dessert with each section flavored in purple berry, watermelon, or vanilla. Layerz! is a two layered/flavored L.F.F.D.D. that can be either cotton candy & vanilla or orange and vanilla. 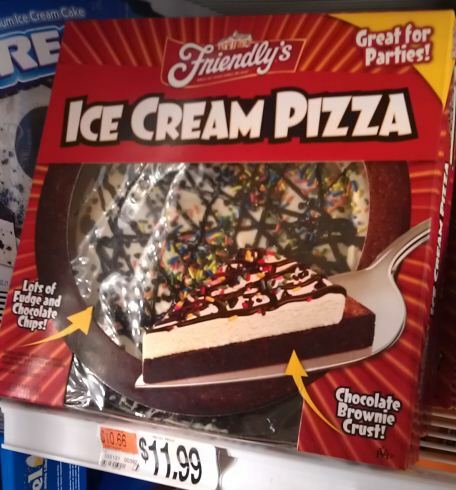 Hey, Friendly's Ice Cream Pizza has finally made it to the state that Friendly's is based in, how nice of them to join us.... oh.... you know I need to try this at some point. 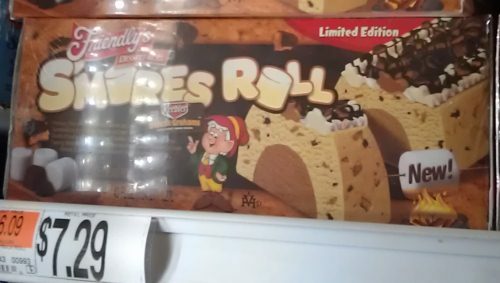 I spied this a few weeks ago at Roche Bros, but I just wanted to share a quick shot of Friendly's Limited Edition S'mores Roll. At 7 bucks it's probably worth a try, especially since I love my s'mores flavors! 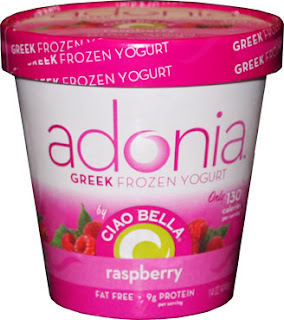 Ciao Bella joins the greek frozen yogurt debacle with Adonia (official website here). It's fat free and packs a whopping 9 grams of protein per serving. The new flavors are raspberry, vanilla, blueberry, key lime, peach, mango and espresso (peach and blueberry also come in bars). I reviewed the Raspberry and while it's got it's good points, it just strikes me as boring so I don't expect to review any of the other flavors anytime soon. 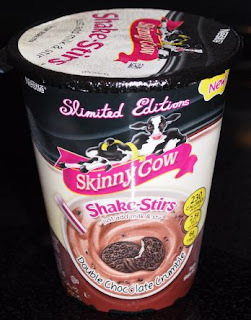 Skinny Cow has the new Slimited Edition line up which includes their new product SHAKE-STIRS. 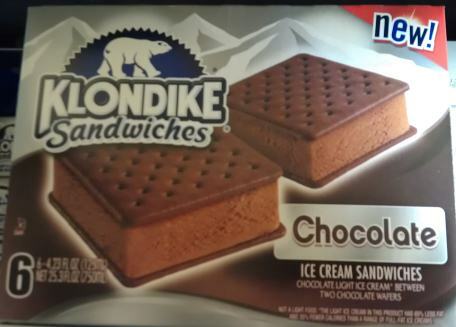 They come in Double Chocolate Crumble and White mint cookie and they are just like the Edy's/Dreyer's Shakes, except these buggers taste just like Skinny Cow ice cream sandwiches (review here). Slimited Edition also includes Oh Fudge Nuts! 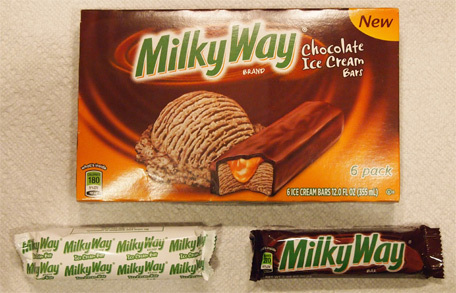 Low Fat Ice Cream Cone, Mmmmocha Truffle Ice Cream Bars, and Best of Both Swirleds Low Fat Ice Cream Sandwiches. I didn't plan on trying them, so Nick reviewed the Mmmmocha Truffle Bars. Talenti has got new gelato flavors for 2012 and I've already two of them. I wasted no time trying Chocolate Peanut Butter Cup (review here) and Black Raspberry Chocolate Chip (review here), but there is a new Banana Chocolate Swirl as well . As always, Talenti brings their craftmanship to each and every pint --- Ok, new April 24th 2012 press release says that Simple Strawberry Gelato and Chocolate Chip-Stracciatella Gelato will also being joining the mix. I'm so excited!! Edy's / Dreyer's has added a new Mango Fruit Bar to their collection. I don't foresee trying this anytime review, so check out Gigi's positive review instead. There will also be a new tropical flavors variety pack which will be a 12 piece mix of Coconut, Pineapple and Orange... whoa, wait, why isn't mango in the variety pack? Oy. I guess they are waiting to see if Mango is a hit first. 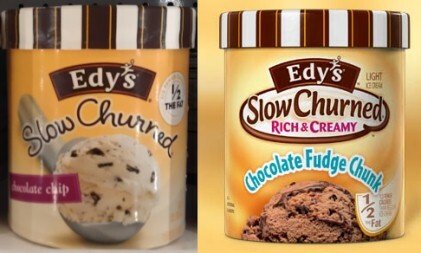 Well I don't know what new flavors Edy's / Dreyer's has in store for us, but they do have newly redesigned packaging to help catch our eye. Yellow is regular slow churned and Blue is the Splenda version, though notice they now use they same lid color (old blue lid to the left there). Do I like it? Yeah, I do actually. Let's compare to the old design. They've gone from a pile of ice cream to a scoop of ice cream still in the scoop. The coloring is softened and unswirled. 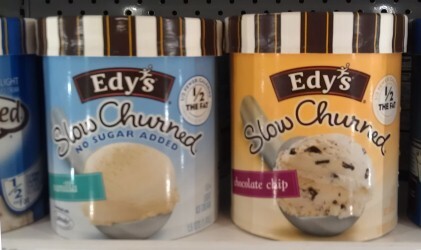 The Slow Churned logo is simplified but also bigger which bumps the flavor name down to a colored tag on the side. I guess the point of the new containers is that the branding is a little more universal and has merged aspects from each variety. The scoop is actually a hold over from their Frozen Yogurt packaging but I like the way it brings the ice cream front and center. 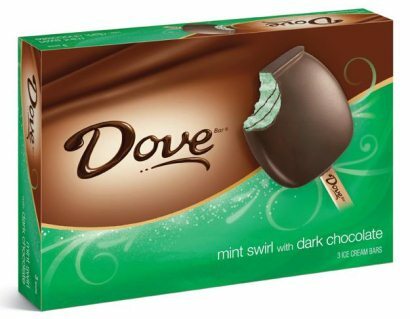 I've seen the new Dove mint ice cream bar in several locations. It's a mint swirl with dark chocolate ice cream bar and I review them here. Found by Nick - This wasn't in the press release! They are a bit dry on first try, but I'm getting us to them! Look close -- there's a Strawberry flavor in there!!! Bookmark this page and come back soon. This post will update as new info becomes available. Woaa cant believe all the new products that you get..looks so many amazing things!! 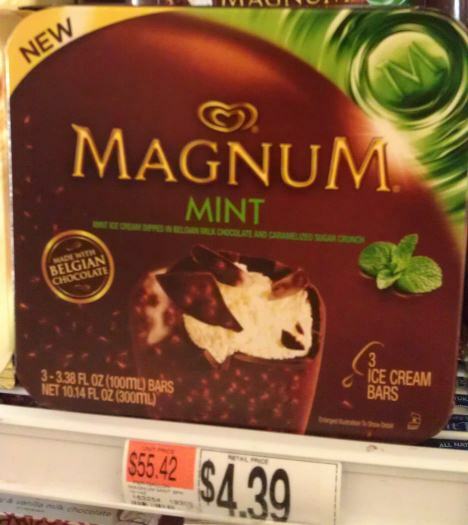 We probably only get maybe about 5/6 new ice cream products every year in the UK :(..we get magnum mint over here though theyre good! Yum! My god this makes me so depressed. When I went shopping today the freezer were so bare. 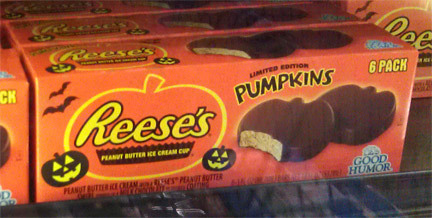 They're just screaming to be filled with these treats, especially those drumsticks. 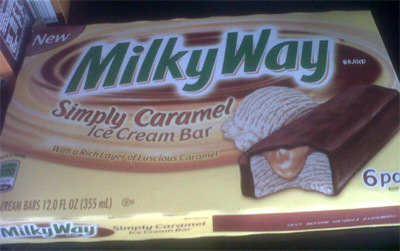 Oh and for the cadbury thing when I sent you my pic there was also a 4th variety that was called carmello aka caramel. Wow! So many of those look so tempting! And I've only tried two of them - Magnum Classic and Almond (this second one is among my favourites, along with Double Caramel and Double Chocolate... which is always #1). is the mint good? cool, gotta add it to the shopping list then. 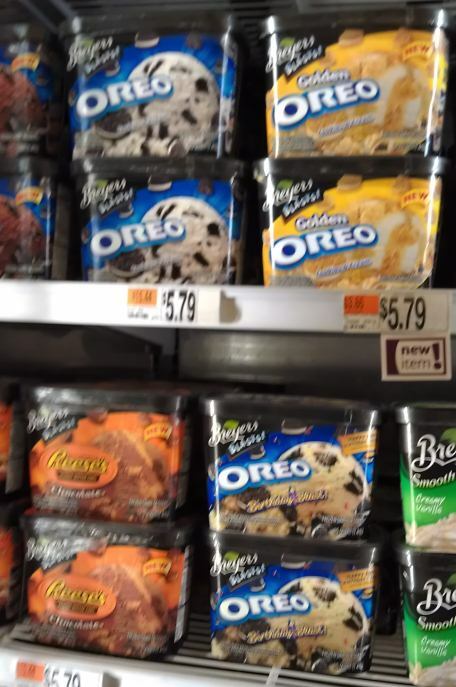 the freezers were packed at stop & shop, not sure I noticed a carmello version, but it could have been hiding. The only new thing I saw that you haven't posted was some new weight watchers novelties. The one that caught my eye was a cherry cheesecake mini ice cream sandwich. OH and when I got back home I had to run to price chopper and it looks like they now carry pints of graeter's ice cream. I'm not a huge fan of cake batter flavor (usually too sweet for my liking), but the fact they mix it with Oreos really has me intrigued. Look for a review in the next few weeks hopefully. Graeters at Price Chopper??? Oh man, I may brave the snow and take the long way home to check this out. Dubba have you tried the Birthday Cake Oreos yet? I bought them on Monday, they are sweet but sooo good! tried them.... too much for me! I finally decided to try Breyer's Banana Split and it was pretty good. I especially like the strawberry swirls in it. 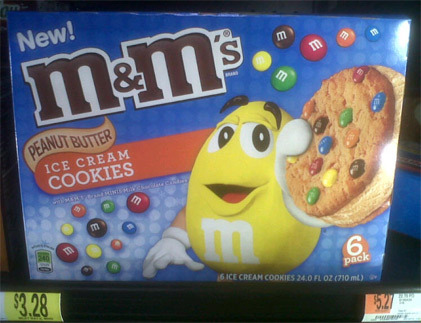 Personally I would like it better if instead of the chocolate pieces they put nuts. I'm not a big chocolate fan and I have never put chocolate pieces on my banana splits before. Now cherry's and nuts then they would have a real hit!! !